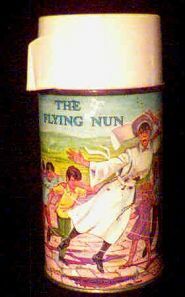 Thermos featuring Sally Field as the Flying Nun. Thermos has some spots of paint loss, but is not bad. Even though I did watch this show a few times, I wasn't really a fan of it. The whole premise seemed a little lame. Why didn't any of the other nuns fly. Too fat? Website design and hosting by Sohodojo Business Services. Item 172 of 466 items displayed in viewer. 0 items in cart.